Media used: acrylic on canvas. The persine of an acute angle (abbreviated “pers”) equals the length of the side opposite that angle, in a right triangle, divided by the triangle’s perimeter. The percosine of an acute angle (abbreviated “perc”) equals the length of the leg adjacent to that angle, in a right triangle, divided by the triangle’s perimeter. The pertangent of an acute angle (abbreviated “pert”) equals the length of the hypotenuse of a right triangle containing this acute angle, divided by the triangle’s perimeter. 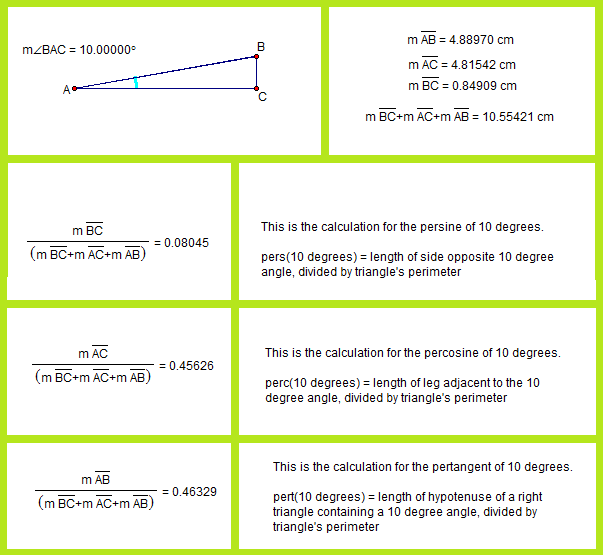 After defining these terms, I used Geometer’s Sketchpad to construct a right triangle containing a 10º angle, and then used the “measure” and “calculate” functions to find the values of pers(10º), perc(10º), and pert(10º). Since these are ratios, they would have the same values shown for larger or smaller right triangles which contain 10º angles. An observation: the pertangents of complementary angles are equal. Why? Because complementary angles appear in all right triangles, as pairs of acute angles in the same triangle. For each such complementary angle pair, therefore, the same triangle is used to define pertangent. The hypotenuse/perimeter ratio (which is pertangent) would, it follows, remain unchanged — because both its numerator and denominator remain unchanged. This relationship does not hold for the tangent function; instead, the tangents of complementary acute angles are reciprocals of each other. Of course, I wanted to know more than just the pers, perc, and pert values for 10º, but I had no desire to repeat the same calculations, many more times, to form a table. 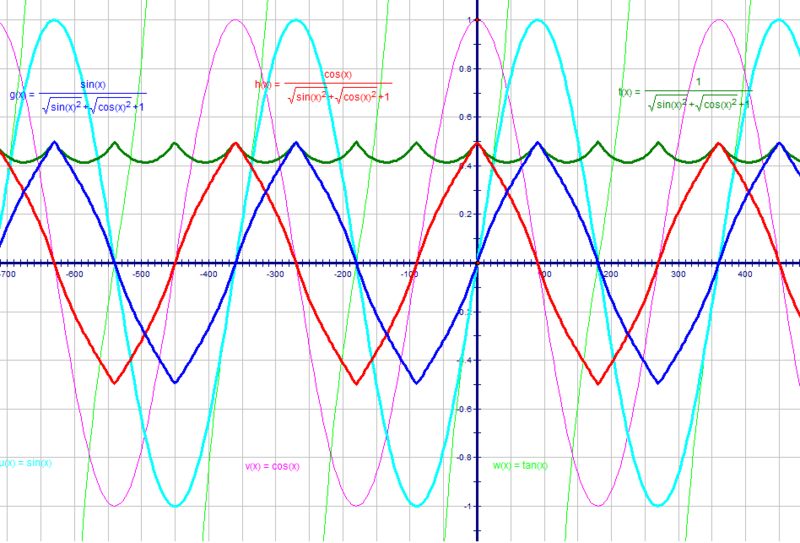 Instead, I simply graphed the functions, again using Geometer’s Sketchpad. The units on the x-axis are degrees, not radians. In the graph above, the dark blue curve is the persine function, with the sine function in light blue, for comparison. Similarly, percosine is shown in red, with cosine shown in pink. Finally, pertangent is shown with a heavy, dark green curve, while tangent is shown as a thinner, light green curve. Entering the equations for these curves was a little tricky, due to the fact that I wanted this graph to venture beyond 0 and 90 degrees, in both directions, on the x-axis. When that is done, the unit circle must be used (in place of right-triangle based definitions), simply because no right triangles contain angles outside this range. The radius of the unit circle is 1, by definition, and that is the hypotenuse of the right triangle which exists in the zero-to-ninety degree part of the domain of the graph above. As a consequence of setting the length of the hypotenuse of each right triangle at 1, the side opposite the angle in question (used for persine) becomes, simply, the sine of that angle, while the adjacent leg’s length is the angle’s cosine. It then follows that the perimeter (the denominator of the pers, perc, and pert ratios) is equal to sin(x) + cos(x) + 1. Calculations are shown on the graph above, and you can click on the graph to enlarge it, to make them more readable. In these calculations, one more adjustment had to be made, and that was to the perimeter portion of each pertrigonometric ratio. Using sin(x) + cos(x) + 1 works fine for perimeter, for the zero-to-ninety degree portion of the domain, but, outside that, negative numbers intrude, for values of sin(x) and/or cos(x). It is my contention that triangle perimeter only makes sense as a sum of absolute values of a triangle’s three side lengths. To obtain absolute values for both sin(x) and cos(x) in the perimeter-part of each calculation, then, I simply squared each of these two functions, and then took the square roots of those squares. The result of this can be seen on the graph, in the curve for the pertangent function, which resembles a child’s drawing of waves in the ocean. On the y-axis, it never reaches as low as 0.4, and its maximum value is clearly exactly 0.5 — at the sharp “wave peaks.” At the (smooth) troughs, the actual minimum is equal to the square root of two, minus one, or ~0.414, although I have not yet figured out exactly why that is the case — I simply noticed it on the graph — but, to investigate it further, I know where to look: the 45-45-90 triangle, since these minima are hit when x = (45 ± 90n) degrees, where n is any integer. The pertangent function has the shortest period of all the functions shown above, at a mere 90º. For tangent, by contrast, the period is 180º. All four of the other functions shown have periods of a full 360º. It is striking that the pertangent and tangent curves bear little resemblance to each other, while marked resemblances do exist between the persine and sine curves, as well as between the percosine and cosine curves. In informal terms, the persine curve is a shorter and spikier (but still recognizable) version of the sine curve (vertically, with the amplitude exactly one-half as great for the shorter persine curve, relative to the sine curve), but, horizontally, the two curves are synchronized. The same relationship holds for the percosine and cosine curves. Also, it is well-known that the cosine curve is simply the sine curve, phase-shifted one-quarter cycle (or 90º, or π/2 radians) to the left. This phase-shift relationship between the cosine and sine curves holds, precisely, for the percosine and persine curves. There is a simple reason why persine, percosine, and pertangent all peak at exactly y = ½. All three functions generalize, for acute angles, to this ratio — (some side of a right triangle)/(perimeter of that same triangle) — and no side of any triangle can ever exceed, nor even reach, half that same triangle’s perimeter. In all three cases, the maximum y-value is only reached, even in the zero-to-ninety degree portion of the domain, for “degenerate cases” — angles of 0º or 90º, which are, of course, not acute angles at all. Interpreted as triangles, these are cases where either a triangle becomes so short that it collapses to a single segment, or the opposite degenerate situation: two parallel lines, connected by a single segment. If you try to make either (or both) of the acute angles in a right triangle into an additional right angle, after all, that’s what you get. To my knowledge, no one has described these pertrigonometric functions before, by this or any other name, although I could be wrong. (If I am wrong on this point, please let me know in a comment.) Regardless of whether this is their first appearance, or not, I did not invent them. The reason for this is simple: nothing in mathematics is ever “invented” — only discovered — for mathematics existed long before human beings existed, let alone started writing things down. How do I know this? Simple: there was a universe here before there were people, and all evidence indicates that it operated under the same laws of physics we observe today — and all evidence to date also indicates that those laws are mathematical in nature. Therefore, with the “pertrig” functions, I either discovered them, or, if they have been found before, then I independently rediscovered them. Finally, I’ll address that question so often asked, about numerous things, in mathematics classes: what are these pertrigonometric functions used for? As far as I know, the answer in this case, so far, is absolutely nothing, other than delighting me by their very existence. It is possible that this may change, for someone might find a way to make a profitable application of these functions — and I won’t get any money if they do, either, for I am not copyrighting any of this. Nothing in mathematics is subject to ownership. Honestly, though, I hope no one ever finds any practical, “real-world” use, at all, for pers, perc, or pert. Right now, they are pure mathematical ideas, unsullied by tawdry, real-world applications, and, well, I like that. I am far from the only person who ever had such an attitude about a mathematical idea, either — such views are actually fairly common in the mathematical community. Most of those who try to discover previously-unseen things in mathematics do so solely, or primarily, for one reason: the joy of discovery, in its purest form. As a proposed new “near-miss” to the Johnson solids, I created this polyhedron using Stella 4d, which can be found for purchase, or trial download, here. To make it, I started with a tetrahedron, augmented each face with icosidodecahedra, created the convex hull of the resulting cluster of polyhedra, and then used Stella‘s “try to make faces regular” function, which worked well. What you see is the result. This polyhedron has no name as of yet (suggestions are welcome), but does have tetrahedral symmetry, and fifty faces. Of those faces, the eight blue triangles are regular, although the four dark blue triangles are ~2.3% larger by edge length, and ~4.6% larger by area, when compared to the four light blue triangles. The twelve yellow triangles are isosceles, with their bases (adjacent to the pink quadrilaterals) ~1.5% longer than their legs, which are each adjacent to one of the twelve red, regular pentagons. These yellow isosceles trapezoids have vertex angles measuring 61.0154º. The six pink quadrilaterals themselves are rectangles, but just barely, with their longer sides only ~0.3% longer than their shorter sides — the shorter sides being those adjacent to the green quadrilaterals. The twelve green quadrilaterals are trapezoids, and are the most irregular of the faces in this near-miss candidate. These trapezoids have ~90.992º base angles next to the light blue triangles, and ~89.008º angles next to the pink triangles. Their shortest side is the base shared with light blue triangles. The legs of these trapezoids are ~2.3% longer than this short base, and the long base is ~3.5% longer than the short base. If this has been found before, I don’t know about it — but, if you do, please let me know in a comment. UPDATE: It turns out that this polyhedron has, in fact, been found before. It’s called the “tetrahedrally expanded tetrated dodecahedron,” and is the second polyhedron shown on this page. I still don’t know who discovered it, but at least I did gather more information about it — the statistics which appear above, as well as a method for constructing it with Stella. It’s a member of a class of polyhedra which have, as faces, only regular polygons with unit size, as well as “triamonds.” Triamonds are 1:1:1:2 trapezoids composed of three coplanar, equilateral triangles. Back in 2006 or earlier, my guess is that I simply made a physical model out of card-stock paper and tape, and then took a photograph of it — something I haven’t done in a very long time, now that making moving pictures of virtual models has become so easy. Another possibility is that I used Zome, an excellent ball-and-stick modelling system available at www.zometool.com. Zome, like Stella, I still use — and I will be using Zome often with students, in class, when school starts next month. Fortunately, I have a lot of Zome! The Zonish Cuboctahedron: A New Near-Miss Discovery? The hexagons here, in this second image, are visibly irregular. The four interior hexagon-angles next to the octagons each measure more than 125 degrees, and the other two interior angles of the hexagons each measure less than 110 degrees — too irregular for this to qualify as a near-miss to the Johnson solids. However, Stella includes a “try to make faces regular” function, and applying it to the second polyhedron shown here produces the polyhedron shown in a larger image, at the top of this post. It is this larger image, at the top, which I am proposing as a new near-miss to the 92 Johnson solids. In it, the twelve hexagons are regular, as are the eight triangles and six octagons. The only irregular faces to be found in it are the near-squares, which are actually isosceles trapezoids with two angles (the ones next to the octagons) measuring ~94.5575 degrees, and two others (next to the triangles) measuring 85.4425 degrees. Three of the edges of these trapezoids have the same length, and this length matches the lengths of the edges of both the hexagons and octagons. The one side of each trapezoid which has a different length is the one it shares with a triangle. These triangle-edges are ~15.9% longer than all the other edges in this proposed near-miss. Has this polyhedron been found before? Is it close enough to being a Johnson solid to qualify as a near-miss? Once I learn the answers to these questions, I will update this post to reflect whatever new information is found. If this does qualify as a near-miss, it will be my third such find. The other two are the tetrated dodecahedron (co-discovered, independently, by myself and Alex Doskey) and the zonish truncated icosahedron (a discovery with which I was assisted by Robert Webb, the creator of Stella 4d). My name made the Stella Library discovery credits! Stella’s creator just came out with a new version of Stella 4d, and a discovery of mine made the built-in library that comes with that software. This is my blog, so I get to brag about that, right? My legal name appears in the small print on the right side, at the end of the first long paragraph. I added the red ellipses to make it easier to find. If you’d like to try or buy this software (I recommend Stella 4d over the other options), here’s the link for that: http://www.software3d.com/Stella.php. I’ve posted “bowtie” symmetrohedra on this blog, before, which I thought I had discovered before anyone else — only to find, later, that other researchers had found the exact same polyhedra first. Those posts have now been edited to include credit to the original discoverers. With polyhedra, finding something interesting, for the first time ever, is extremely difficult. This time, though, I think I have succeeded — by starting with the idea of using regular pentadecagons as faces. Software credit: Stella 4d was the tool I used to create this virtual model. You can try a free trial download of this program here: http://www.software3d.com/Stella.php. Update: once again, I have been beaten to the punch! A bit of googling revealed that Craig Kaplan and George Hart found this particular symmetrohedron before I did, and you can see it among the many diagrams in this paper: http://archive.bridgesmathart.org/2001/bridges2001-21.pdf. There is a minor difference, though, between the Kaplan-Hart version of this second symmetrohedron, and mine, and it involves the thirty blue faces. I adjusted the distance between the pentadecagons and the polyhedron’s center, repeatedly, until I got these blue faces very close to being perfect squares. They’re actually rectangles, but just barely; the difference in length between the longer and shorter edges of these near-squares is less than 1%. I have verified that, with more work, it would be possible to make these blue faces into true squares, while also keeping the pentadecagons and triangles regular. I may actually do this, someday, but not today. Simply constructing the two symmetrohedra shown in this post took at least two hours, and, right now, I’m simply too tired to continue!